Our Library is open most days at break, during lunchtime, and after school. Library books can be checked out during those times. Computers are available in the library on a limited basis. Food and drinks are not allowed in the library. The following resources are freely available on all school computers. Special login information is required to access GALE databases and Grolier Online Encyclopedia from home. To view the information, enter the username and password listed below. Be sure to accurately cite your sources to avoid plagiarism. Plagiarism involves the use of other's ideas or writing as one's own. Use these printer-friendly templates to correctly cite your sources. Cover textbooks with paper covers that tape only to themselves and not to the book. Leave pages and book bindings clean and whole. Remember that we charge for tears, stains, or writing (except for names on the inside cover). Inspect your textbooks when you receive them; if you see damage in books, please bring it to the attention of the librarian immediately. 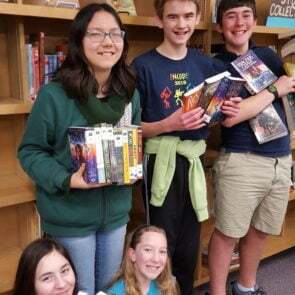 Are you looking to donate books to the Cheldelin Library? Please give Sarah Farrell a call.